Check Latest Customer Review on Amazon.com, Now! 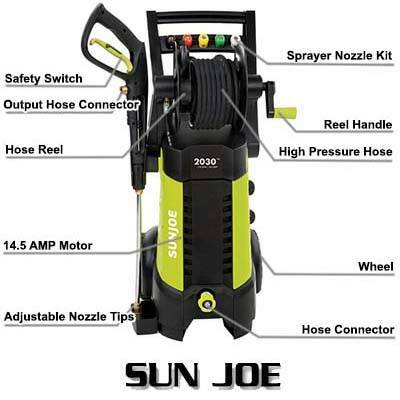 Sun Joe is a well-known brand in pressure washer world that develops electric pressure washers for residential use. Sometimes people get confused between the two models, SPX3000 and SPX3001 and end up buying the one that he doesn’t want. Most of the features you will find the same among these two models so see carefully the differences before you purchase. Sun Joe SPX3001 Electric Pressure Washer has a detergent tank of 40.6 ft. Oz. (1.2 L) and it also has an onboard hose reel that the other model doesn’t have. This pressure washer generates the water pressure of 2030 PSI along with 1.76 GPM water flow. With the two wheels, you can freely move the device to your desired place. The manufacturer included in this device that helps you in doing a smooth cleaning of your car, motorcycle, RVs, driveway, patio and many more things. The device comes with a powerful 14.5 Amp/1800 watt motor that generates 2030 PSI of water pressure. The powerful pump has the capacity to deliver water 1.76 Gallon Per Minute (GPM) for the maximum cleaning power. The device has been approved by CSA for your full safety and optimum performance. Sun Joe SPX3001 Electric Pressure Washer has been featured with Total Stop System (TSS) facility that stops the motor when you do not engage the trigger. An extra large 40.6 Fl. oz. (1.2 L) the detergent tank has been included to carry the detergent conveniently. There are a pro-style spray gun and a spray wand that has a comfortable grip. The machine provides a 20-foot long high-pressure hose and 35-foot long power cord that has a GFCI plug for comfortable using in wet ground. Five extra nozzle tips are given for different use they are 0, 15, 25, 40 and a soap applicator nozzle to handle light, medium and heavy-duty cleaning. The built-in onboard storage stores the HP hose, spray gun and wand, power cord and makes the device compact. The weight of the machine is 32 pounds and the dimension is 14.4-inch depth, 33.5-inch height, and 16.5-inch width. It has two wheels attached for the convenient movement of the device. Powerful Motor: Sun Joe SPX3001 Electric Pressure Washer provides 2030 PSI water pressure which is quite enough for cleaning all the tough stains from any surface in your residence. You will not feel the powerless and with the comfortable spray gun and wand your cleaning will become efficient. Along with 1.76 GPM water flow the different nozzles increase the power. Total Stop System (TSS): It is a modern technology that allows stopping the motor automatically when you are not using the device. This facility makes your motor and pump’s life longer and it saves your valuable energy. So you can relax and use the device without thinking much about the motor’s durability. Different Nozzle Tips: Sometime it becomes difficult to do all sort of cleaning with the same nozzle tip as all the dirt are not equally tough. For your different use, five different nozzle tips are provided starting from 0-degree pencil point water flow to 40-degree wide span. The soap applicator nozzle gives your car a shiny look. On-board Detergent Tank: It is always annoying to carry a bucket of detergent while you are busy doing the cleaning. The on-board detergent tank gives you relief from this tension and the on-board storages make the device compact one. Warranty: The two years warranty secures your valuable investment. For any kind of manufacture defect, the Company will either solve the problem or change its parts. Some of the users said that the hose reel is a little clumsy to use and the soap applicator nozzle provides low water pressure. These problems you might find in most of the water pressures. Some users find the moving handle a little short that creates problem while carrying the device. All the devices have their pros and cons. You have to choose a device that actually fulfills your requirements apart from its problems. 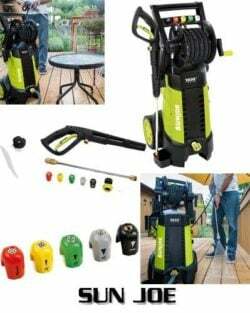 Sun Joe SPX3001 Electric Pressure Washer is such a device that fulfills all your requirements for using in your residence. You will get many facilities such as 2030 PSI water pressure, five different nozzle tips, on-board detergent tank, Total Stop System (TSS) and many more that will help in your efficient cleaning. If you think about your budget the device is not very expensive as when you compare it to a gas run pressure washer. Besides, you are getting two years of warranty so that you don’t have to spend any money during this time. All the features and the facilities make the device a compact one and one of the best pressure washers available in the market. Click to Check Latest Price & Buy with Free Shippment on Amazon.com, Now! You should disconnect your hose from the pressure washer when you would finish your cleaning job. If you don’t disconnect, the hose will impair. No, the hose stays connected all the time. JUst turn off the machine, press the gun to empty the water and roll up the hose. If you get the Sun Joe extension, some same it can be rolled up some say no. I haven’t tried it yet.